To bridge the gap between the old Hall being taken down in 2008 and the opening of the new Hall, in May 2009, Everyman, a Fifteenth Century Morality Play, was performed in four local churches on successive nights. This was a considerable feat in production terms when each venue varied considerably, e.g. with the pulpit (from which God spoke) on different sides of the churches, and vastly different acting areas. BHADS would like to thank all the village communities for welcoming us into their churches. The play opens with God telling us of His anger. He sees that mankind has become too absorbed in material wealth and riches to follow His law. God feels taken for granted, because He receives no appreciation for all that He has given to humanity. God calls Death, His messenger, and tells him to go to Everyman (an allegorical representation of anybody living without proper fear of God) and summon him to heaven to make his reckoning. It is then that he will be judged, and despatched either to heaven or to hell. Upon hearing this, Everyman is distressed as he does not have a proper account of his life prepared. Everyman tries to bribe Death and asks for more time. Death denies this request but tells Everyman he may find a companion for his journey, someone to speak for him. Fellowship, representing a person’s friends, happens along and promises to go anywhere with Everyman. However, when Fellowship hears of the true nature of Everyman’s journey, he immediately refuses to go. Fellowship says that he would stay with Everyman were they having fun, but will not accompany him on such a journey. It is established here that Fellowship is a personification of the “fair weather friend”. Everyman then sees Kindred and Cousin, who represent family, and asks them to go with him. Kindred flat out refuses, saying he’d rather go to parties and Cousin says, “No, I have a cramp in my toe,” so she can’t go either. Cousin also presents a fundamental reason why no one will accompany Everyman: they have their own accounts to write as well. Everyman realises he has always had great love for Worldly Goods, and so Goods will surely come with him on his journey to Death. Goods will not come with Everyman; she says it is to Everyman’s damnation that he put so much thought in his life to Goods and therefore Goods would make Everyman’s case even worse. Everyman then turns to Good Deeds. Good Deeds says she would go with him, but she is too weak as Everyman has not loved her. She sends her sister Knowledge with Everyman, and together they go to see Confession. There, Everyman repents of all his sins, and punishes himself with a scourge, and Confession recommends penance to Everyman. Everyman is now absolved of all sins, and Good Deeds becomes strong enough to accompany him on his journey. Knowledge gives Everyman a garment made from his own tears, called Contrition. Good Deeds summons Beauty, Strength, Discretion and Everyman’s Five Senses to join them. They all agree to go with him, after he goes to a priest to take the sacrament. Again, when Everyman tells them where his journey ends, all but Good Deeds forsake him. This is because beauty, strength, discretion, and Five Senses are qualities that often leave a person as they get older. Even Knowledge cannot accompany him beyond the point where he leaves his physical body. Everyman gets into his grave. 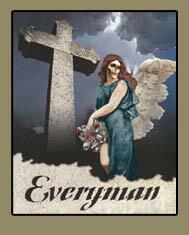 Everyman and Good Deeds ascend into heaven, where they are welcomed by an Angel. A Doctor, representing a scholar, then explains the moral of the story: that in the end, a person will only have his Good Deeds to accompany him beyond the grave. True, even today. It should be noted that throughout the medieval period the belief was that every man’s deeds, both good and bad, were written down in a Book of Reckoning, or Book of Count. He would be called upon to show that Book to God when he died, and God would judge him fit for Heaven or Hell based on what was written in his Book of Reckoning. Confession and penance formed an integral part of this belief, and a man’s good deeds have no merit if he is guilty of unforgiven mortal sins, but they revive and have merit as soon as his sins are confessed and absolved. At the time Everyman was written, there was a growing disquiet about the sale by some priests of “Indulgences”, which Martin Luther described as the “purchase and sale of salvation”, whereby a person could buy remission of all their sins, past and future. This was one of the causes of the Reformation. Latin was in common use by the educated at this time: In manus tuas commendo spiritum meum was said by the dying – Into thy hands I commend my spirit. And God, in judgement on a sinner, would say Ite, maledicti, in ignem aeternum, which in English would be Go thou, cursed one, into eternal fire.